Yes, some spots are very famous in the world and maybe not so original to write about; but when there is a special connection between one person and a place, even one of the most popular churches in the world gives us a little more of its history. My connection with this spot is sentimental: I’ve passed some special romantic nights in its gardens. 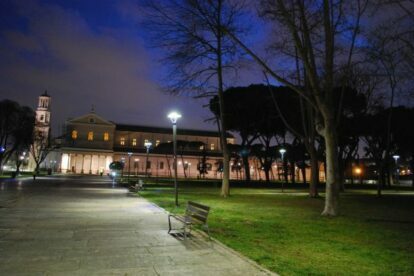 When the Basilica closes, people from the neighborhood visit the large gardens beside Via Ostiense to take out the dogs or to lay down with a bottle of wine and some of them, I’m sure, secretly make love behind bushes. I prefer Basilica of St. Paul to that of Saint Peter because it gives to me more sense of freedom. There are no metal detectors, no security guys looking at you askance. Every time I’ve been there I’ve always found it quiet and airy. Maybe I was lucky, maybe not, but I go there whenever I can, it’s so peaceful. I don’t mention the history and the architecture of the church because there are a lot of experts who can do better than I. I recommend to just go and take the right time to catch the spirit of this spot which concerns not only Christianity but something much more significant.